I came across this old photo a few weeks ago, circa 1977. You can tell it's the 70's, I'm wearing a rainbow shirt, carrying a leather purse that had flowers painted on (remember those?) and was growing out my Farrah Fawcett hairstyle. It's not the best picture, but still a memory of a vacation I want to remember. That's it for today, aloha. Beautiful page, I love the bright colours and that wood grain background :). Lovely page! Current with a hint of retro - love it! Amazing! I love it. 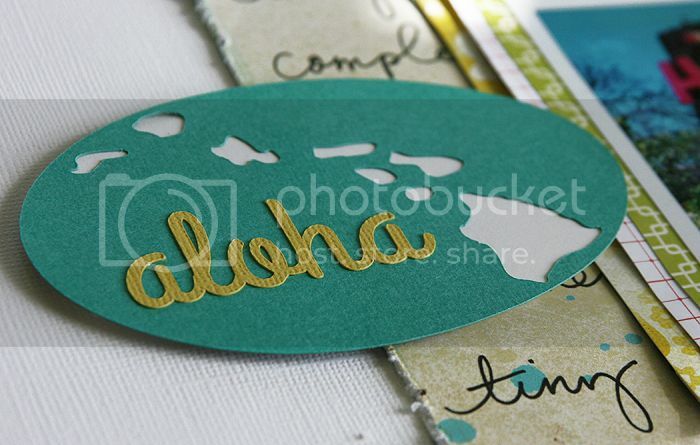 Love the islands tag and lovely design - looks really cool! Great use of your die-cutter for the islands! Lovely page! Beautiful! I'm loving that Alaskan die cut you used for the title! Love that color combo on white! Awesome page Mary Ann! Love these colors and your Cameo cuts!! what a pretty layout, is MH line not just so so so pretty i LOVE it all. OY, I want a Cameo so bad! i love that aloha cutout! !